Summary of various concepts that are central to radio communication. Sharing of communication channel among different data streams. FDMA (frequency-division multiple access): different frequency bands for different data streams. 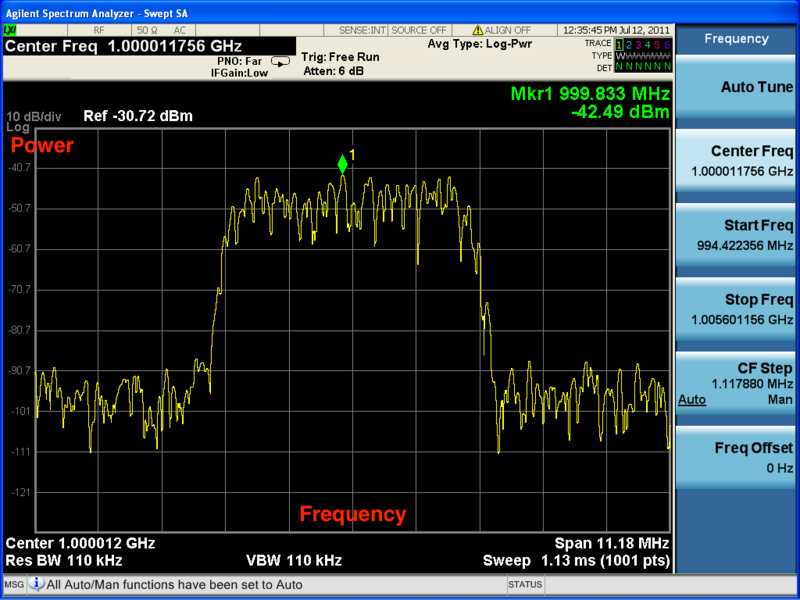 There are gaps (guard bands) between these frequency bands. Based on frequency-division multiplexing (FDM). OFDMA (orthogonal frequency-division multiple access): signals of different data streams are orthogonal to each other, so that the guard bands can be eliminated. Based on orhogonal frequency-division multiplexing (OFDM). Sharing of communication channel among the two directions of a data stream. Both, FDD and TDD, ar specified by 3GPP. However, FDD is the commonly used method, and TDD is used only for niche applications. As for UMTS, both, FDD and TDD, are specified by 3GPP, however, FDD is the commonly used one. “Pack” information to be transmitted onto an analog carrier signal. The information to be transmitted is an analog signal. The information to be transmitted is a bit stream. Based on keying: the final modulated signal has a finite number of discrete states that represent a finite number of digital symbols. A symbol is a finite-length sequence of bits. For example, if the symbols are 8 bits long, there are 256 different symbols, and thus 256 distinct states of the final modulated signal. RSRP (reference symbol received power): average received power from the resource elements that carry reference symbols. Measures power from specific antenna sector by excluding noise and interference from other sectors. Used in LTE. RSRQ (reference signal received quality): (N*RSRP)/RSSI, with N = number of resource blocks over which RSSI is measured. Used in LTE. RSCP (received signal code power): received power from a specific data stream, distinguished by a CDMA code. Used in UMTS. Observe magnitude of a signal with respect to frequency. Describe time series by comparing them to sines an cosines. Given a time series, figure out how to construct it using sines and cosines (Fourier representation for a time series). Time during which the attenuation and interference of a channel is considered as constant. 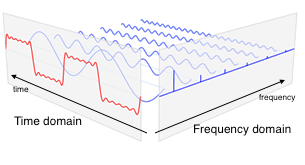 In a multipath scenario, different paths of the same signal may have different Doppler shifts (change in frequency due to velocity of transmitter of receiver). The range of these Doppler shifts is the Doppler spread. Doppler spread negatively affects . Variation of attenuation of a signal. Can be combated by diversity (multiple antennas at receiver and/or transmitter). Multipath-induced fading: receiver sees superposition of copies of the transmitted signal. Each copy experiences a different attenuation, delay, and phase shift. This can result in either constructive or destructive interference, and amplification or attenuation of the signal. Shadow fading: signal attenuated at certain locations or frequencies to to obstacles causing shadowing. Slow fading: large coherence time with respect to delay requirements of application. Attenuation and interference can be regarded as static over the period of use (e.g. data session, call). 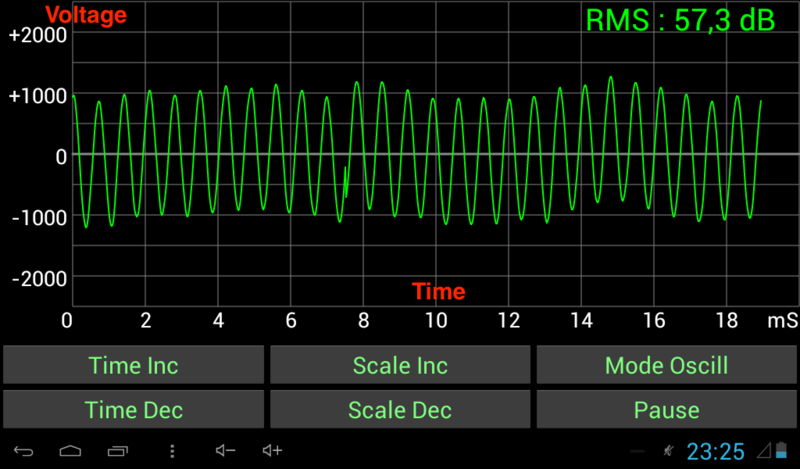 Fast fading: small coherence time of channel with respect to delay requirements of application. Attenuation and interference vary over period of use (e.g. data session, call). Different frequency components of a signal experience different attenuation and interference. Equivalent to time dispersion (signal energy associated with each symbol is spread out in time). In OFDM frequency-selective fading is mitigated because bandwidth is divided into narrow subcarriers that are smaller than the frequency-selective fading granularity. Replication of information bits as one or more code bits (i.e. introduction of redundancy). Noise that is intrinsic to the conductor even without any applied voltage. Generated by the thermal agitation of the charge carriers (usually the electrons) inside the conductor. The power of thermal noise depends on the temperature of the carrier: the higher the temperature, the higher the power. Thermal noise is approximately “white” (see White Noise). Random signal with a constant power spectral density. White noise with each sample (time series point) having a normal distribution with zero mean. 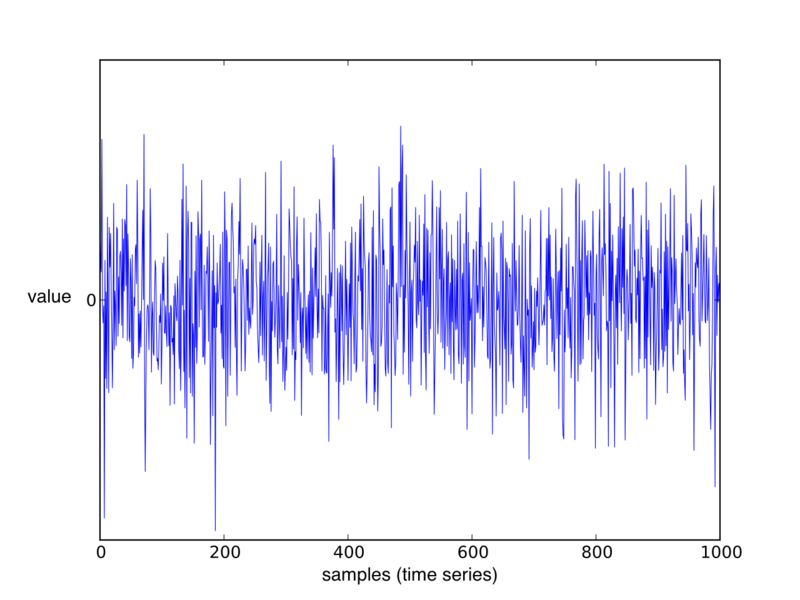 Figure: Gaussian white noise signal (time series).